Here’s the link to the full results from IM Boulder 2017. The Course Rating for IM Boulder is – 03:11. IM Boulder is a P-2000 race. It has a total prize purse of 40.000 US$, paying 6 deep. 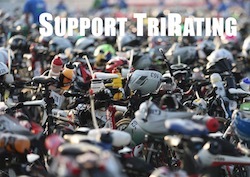 The strength of the field is 5% of a typical Kona field. Mantell raced here in 2015! Give the man some respect! True, he was second in the AG-only event, finishing in 8:54. Boulder is his first Pro IM, so he’s unrated for now.